Once an aspiring symphony conductor, Story didn't even know she could sing - much less write songs - until she was in her early twenties. Today, Story is not only a gifted vocalist and worship leader but also the composer of one of the most beloved worship songs of our generation - "Indescribable." The song has topped charts and been recorded by multiple artists, but most importantly, it has helped people all over the world experience our magnificent God. Story had no idea her life would be used for such a purpose. Set to release her label debut on INO Records (Sara Groves, MercyMe, Derek Webb) in January 2008, Story is still learning that God's plan is far deeper and wider than she ever thought possible. "I was a YoungLife leader, and I saw another guy in line wearing a YoungLife t-shirt," Story recalls. "He said he was in a band and asked me if I wanted to come play with them. I had never played in a band - it had never even crossed my mind." The band was Silers Bald, who would later become a popular indie pop-rock band in the Southeast. The young man she met was vocalist Shane Williams, and by the time they'd made it through the registration line, Story was their newest female member. Laura Story started out playing string bass, graduated to electric bass, and then took a stab at vocals when the original female vocalist left. Completely out of her comfort zone but willing to trust God with her newfound vocal ability, she even tried her hand at songwriting, and their fans desired more. "The Lord taught me that it's not necessarily what I think my strengths are. That's not how He determines what He's going to use," says Story. Five years and many road miles later, Story found herself being led a different direction musically, just as Silers Bald was on the brink of signing a deal with Essential Records. "I knew the Lord was telling me it was time for something new, and I needed to be in or out," says Story. They amicably parted ways and Story ended up touring with folk-rock artist Andrew Peterson that spring. When her manager suggested she record an independent album with the songs she had written while in Silers, Laura was still unconvinced her vocals could stand on their own: "Why would I do that?" she answered. "That would mean I'd have to sing on it!" Besides, she was out of money and didn't have enough songs for a full record. 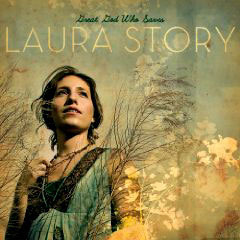 In 2005, Laura Story released her second independent album, There Is Nothing, produced by Ed Cash and Mitch Dane (Jars of Clay). That same year she married her high school sweetheart, Martin Elvington, and moved to Atlanta to become the worship leader and women's pastor for the arts and music community at Perimeter Church. "There was a time he was on a breathing machine and we weren't sure he was going to make it. I spent my whole life singing, ''Tis so sweet to trust in Jesus,' but until Jesus took me through something where my only option was to trust Him, I didn't really know that sweetness," reflects Story. While supporting her husband through surgery, radiation, complications, and intense physical therapy, Story has composed new songs with meaty, real substance that have ministered to her as much as they will minister to her listeners. "It's hard to understand why God would allow us to go through this, but I know He works all things together for good, and I feel my new album is reflecting that. Though He leads us through valleys, that's when we get to trust Him and draw closer to Him all the more. Though I've doubted, His grasp has never released, never slipped. He's remained completely faithful to me. He has proven that He really is my foundation and my hope." "God has really blessed me with some insight into who He is and what that has to do with me. For some reason He just gives it to me in song form." Laura Story has learned that no matter what comes around the next bend, it's going to be an incredible view.